All H2OtoGro® hydroponic systems are manufactured using 100% Food Grade, "Blackout" style, customized reservoirs and lids. Our "Complete Hydro Kits" include STARTER PACKS that include enough clay pellets, rockwool squares, and premium nutrients to start your first set of plants. Deep Water Culture system ~ the roots are suspended in the reservoir beneath the net pots, where they bathe in nutrient-rich solution throughout the entire grow cycle. Hydroponics increases the plant yield and reduces grow time. 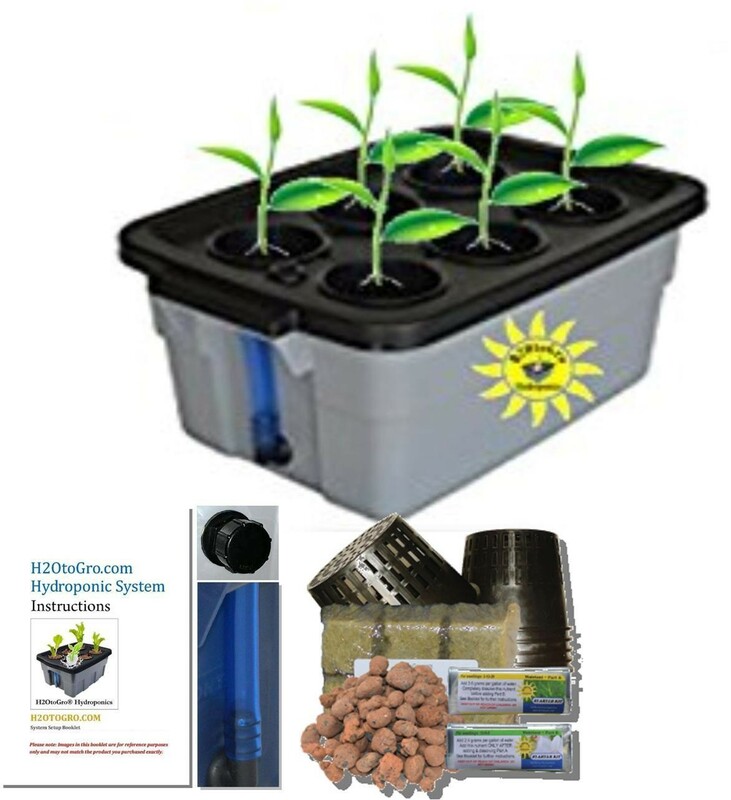 Complete hydroponic starter kit is perfect for beginner, seed-starting or cloning. This Kit Includes: Custom "blackout style" reservoir with custom lid, your choice of size and quantity of net cups, STARTER PACK of clay pellets, rockwool squares, and nutrients. Self-watering (Top Feed) Kit (160 gph submersible pump, water lines, drippers, and stakes. The growth rate on a hydroponic plant is 30-50 percent faster than a soil plant, grown under the same conditions and the yield of the hydroponically grown plant is also greater. Hydroponic plants have fewer problems with bug infestations, fungi and disease so fewer or no pesticides are used on the plants. A DWC system uses a dedicated reservoir filed with a nutrient rich water solution to contain the roots of a plant. There is no messy dirt or weeds to pull. What makes our systems better? Quality materials – We use quality materials meant to last and chosen for their specific qualities. Other systems may be less expensive but they cannot compete with our quality. Design – Our systems are designed for a specific purpose and that is to grow the best plants possible with the least amount of time and effort on your part. Whether you are using our compact 3 gallon system or our 12 bucket grow system you will get the most effective system possible.